“lightears” is the long awaited debut album by Berlin´s duo Leo Mars. After a year of trial and error, a lot of sessions, sound collecting and analysation of possibilities a precisely crafted, yet astonishingly free floating album came to life. In times of almost infinite sounds, instruments and styles it took the duo some time to come up with the basic material, form a language and then of course learn to speak it. Hours were spent in the studio and their favourite lebanese restaurant discussing the world of sound. “lightears” intelligently smudges the borders between a classic drone, an underground noise, a playful improvisation and an old fashion musique concrete record. All the genres fall into place rather unpretentious – pure sound excitingly assembled to challenge ones listening habits. A harsh production always bouncing back and forth between digital, crisp electronics and field recordings pushed way over the edge. With a rather minimal gear and set up LEO MARS managed to manoveur themselves somewhere inbetween a bedroom thrashing noise keyboard project and a theoratical paper score composer duo. Performing in a trance – allowing things to happen – awaken – making a conscious decision – slipping back into space. 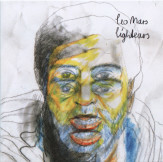 Leo Mars are the Berlin-based duo of Marcel Türkowsky and Stephane Leonard, “Lightears” being their inaugural outing. What they do is pretty much in your face: roaring distortion a go-go, harsh layers, dissonant bitterness, absolutely merciless puncturing of the auricular membranes through a choice of frequencies that´s not an actual “choice”, rather a penalty. These guys kick hard, though not always intelligibly. On a first listen I thought about the customary replication (there are hundreds by now) of the wall-of-guitar sound of Birchville Cat Motel and the likes, but a closer look (to the press release, too) reveals that also mangled field recordings and overexcited electronics are a part of the game. Whatever, the sonic spectrum investigated by the couple mostly belongs to the regions of aural pain, especially if you decide to sting yourself at more than medium listening volume. Yet a strictly musical aspect besides the noisy factor does exist, and is precisely what saves the record elevating it to another level in certain occasions. It´s explicated by a powerful purr, an underlying pulse that appears in a few instances – particularly at the opposite extremes of the CD – furnishing the music with entrancing features that turn the fundamental vibration into a rainbow connecting the ears across the back of the skull. Everything becomes tolerable in that moment. I´m willing to believe that, by concentrating on these droning matters and not on ear-killing acridness, Leo Mars could engender something important in the future. Let´s wait and see. Leo Mars or formerly know as the Leo Mars Ensemble is Marcel Türkowsky and Stephane Leonard. Both have been playing, improvising, writing and recording experimental and drone for quite a while. “Lightears” is a collection of seven tightly wound electronic and noise pieces with a sound harkening back to early Japanese power electronics. The material utilizes a range of sources: distorted organs, tape loops, short wave radio, to general hum, noise and probably various other sounds.